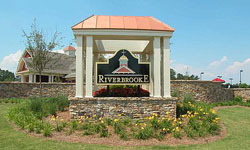 Riverbrooke, located in the City of Suwanee in Forsyth County, has approximately 200 single family homes. Residents of this close-knit community can walk along paved sidewalk paths and use such amenities as the community swimming pool, tennis court or playground. Riverbrooke is also located close to Highway 141. Students attend Settles Bridge Elementary, Riverwatch Middle and South Forsyth High schools in the Forsyth County School District. Home prices range from $200K to $300K.